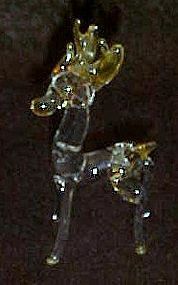 This wonderful delicate mini deer is hand blown and measures 2 1/2" tall. Two colors of crystal clear with orange antlers and tail. Perfect condition. I have a larger one listed that matches perfectly.